Ebay is a potential minefield for the 7Axx newbie. Apart from all the mis-represented junk out there, you've got the chancers who list watches with speculative 'pie in the sky' Buy-it-Now prices, hoping that some mug punter who doesn't know the market (or has done zero research) will fall for it. As collectors, hopefully most of us will have a pretty good grasp of what is a 'fair market price' for the condition and the relative desireability / rarity factor of the particular model in question. Then occasionally, you'll see gullible sellers almost giving them away, for well below market value - presumably having fallen victim to the temptation of the seemingly innocent question: 'Do you have a Buy-it-Now price ? ', from a savvy buyer - who, often as not, turns out to be a dealer that subsequently sells it on for quick profit. Then there's always the lure of the magic (but oft abused) term NOS (or NOS condition) - which all of us secretly desire. Here's a classic case to get this topic rolling. The stainless grey-dialed 7A28-7079 SPR014J isn't exactly rare. In fact they're pretty common on eBay in the States. Sorry, Don. 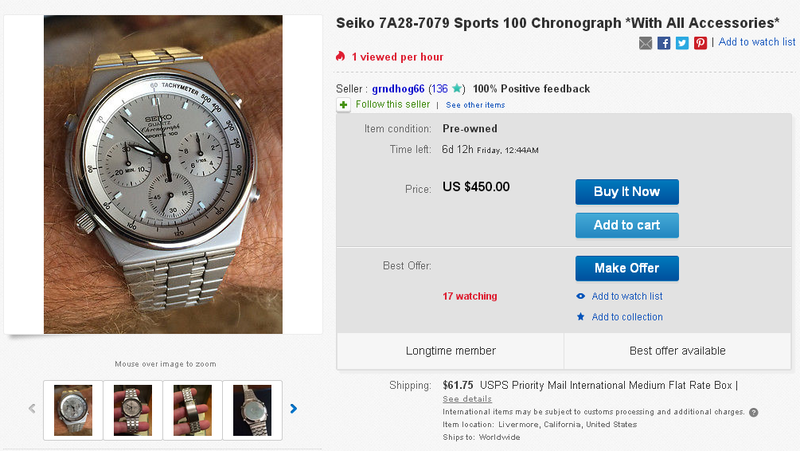 Selling this beautiful Seiko chronograph, from my personal collection. The condition is fantastic, and it includes original box, instruction manual & hang tag. Bracelet is basically flawless, and is full length. All functions are working properly, and hands snap back to zero. If you have any questions regarding item condition (or shipping), PLEASE ask before you bid. If you have Zero Feedback, please contact me prior to bidding. Incidentally, the would-be seller grndhog66 is none other than Groundhog66 - 'Administrator' of the zoo known as WristSushi. I got myself banned from there (deliberately) a couple of months back. I'm listing my watch thats like new condition never worn its a 15 jewel chronograph watch that is well worth the money just dont like metal bands and dont want to change this one so bid with confidence thank you. Seiko 7A28-7079 Bracelet. New old stock with 11 removable links! So what's the 'right price' for a mint condition 7A28-7079 ?